Lightning Powder 2-0500 Portable Field Kit FREE SHIPPING! The Lightning Powder Portable field kit provides an efficient way for fingerprinting to take place, even outside of the jail, or sheriff's office. This transportable unit has everything an investigating officer needs for print impressions requiring a slab and roller as well. Officers can be rest assured that this portable fingerprinting unit is just as reliable as traditional, standard impression stations, providing the same high quality visibility, and capturing clean prints, even while out in the field! 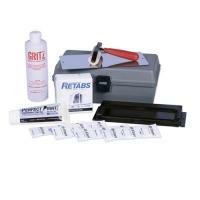 Everything that is needed to properly fingerprint a potential suspect is included within this kit. ©2002-2019 CopsPlus.com: Lightning Powder 2-0500 Portable Field Kit FREE SHIPPING!